2014 Toyota Corolla Pros and Cons: Why (Not) This Car? Among compact cars, the Toyota Corolla has long been the boring choice, in ways both good and bad. The cars weren't at all exciting to look at or drive, but they were economical and extremely reliable. Toyota has become increasingly aware that these and other practical concerns aren't enough to attract younger buyers, so for 2014 the Corolla has been dramatically redesigned. But are the changes enough? In the other corner: the compact that would be king (of the segment), the Sentra that Nissan redesigned last year. Ideally we'd be comparing the sporty-ish SR trim level, as it is the closest match within the entire segment to the Corolla S, but I tested the top-of-the-line SL. Adobe brown seat option injects some much-needed warmth into the otherwise black interior. Why the 2014 Toyota Corolla? Even though the Corolla is a new design in its first year, among current compact sedan it will likely last the longest while requiring the fewest repairs. Few other models in TrueDelta's car reliability survey have been as consistently reliable. Compared to the Corolla LE Plus, the tested Corolla S Plus adds 17-inch alloy wheels (vs. 16s), rear disc brakes, a leather-wrapped steering wheel with paddle shifters, a rear spoiler, and a chrome exhaust tip--a decent amount of kit for the grand added to the bottom line. A surprise: even on the lowest trim level the low-beam headlights are LEDs, tech usually only available for a hefty sum on far more expensive cars. Further add a sunroof and the Convenience Package (nav, proximity key) to the Corolla S Plus and its sticker rises to $22,870. The Nissan Sentra SR is the only other car to offer a similar level of content at a similar price, specifically $22,410. Nearly all other competitors require leather upholstery and other uplevel features to get a sunroof or nav. The Mazda3 i Grand Touring is an exception, but does have about $800 in additional content that helps bump its price a substantial $1,720 higher than that of the Toyota. Beyond the initial purchase price, Corollas hold their value and are cheap to insure, maintain (see above), and operate (see below). So in terms of total cost of ownership they're nearly impossible to beat. Rear quarter is the most interesting angle. Those seeking to maximize fuel economy should check out the Corolla LE Eco, with EPA ratings for 30 mpg city, 42 highway. The regular LE checks in at 29/38, and the S at 29/37. Even the last is within spitting distance of the best in the segment, including the 30/39 Sentra. In my efficiency-minded suburban driving the trip computer reported an average of 37.7, a bit better than the 36I managed with the Sentra. Driving with less care for fuel economy netted 32, about even with the Nissan. The Toyota couldn't quite match the Nissanona 65-mph highway drive, though, with a two-way trip computer average of 38 vs. 40 (quite close to those EPA estimates). The Corolla's specs indicate rear legroom worthy of a large sedan, 41.3 inches, a substantial four more than in the Sentra and five more than in last year's Corolla. To provide this increase, Toyota stretched the car's wheelbase by four inches, taking it from the shortest in the segment to the 106.3-inch dimension shared by the Hyundai, Kia, Mazda, and Nissan. The Ford Focus, with a 104.3-inch wheelbase, is now the briefest of the bunch. The Corolla's overall length has also grown by four inches, to 182.6. Subjectively, the Corolla's advantage over the Sentra seems about half as large. Still a lot of legroom for a compact, especially in conjunction with a more comfortably positioned seat. Rear seat headroom is in much shorter supply in both cars. The 2014 Corolla is not a beautiful car. Unlike many competitors it's not trying to be one. At least I hope it isn't, as some people will even find the car ugly. But its exterior is distinctive and intriguing, something that cannot be said about those of the ten forgettable generations of Corolla sedans that preceded it. Where nearly all competitors have arching roof lines and flowing curves, the new Corolla has the hard edges and aggressive angles first seen on the second-generation Scion tC coupe. 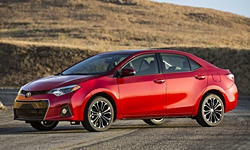 Why Not the 2014 Toyota Corolla? The new Corolla'sinterior, like its exterior,includes some intriguingly bold design elements. Unlike in the past, no attempt has been made to offer some of the ambiance of a Lexus at a much lower price point. (For this you'll want the Sentra.) Instead, the designers borrowed a hard-edged, futuristic theme from the latest Avalon, itself much more aggressively styled inside and out than in the past. I especially like the color-keyed (bronze or blue) highlights that run horizontally along the instrument panel and doors. Unfortunately, this interior design is badly undermined by Toyota's idea of an upgraded interior. Some of the surfaces are soft to the touch, most notably the upholstered armrests on the doors. But too many others have the shiny appearance and hard, rough feel of cheap plastic. Even the soft-touch instrument panel has the sheen of hard plastic (the much more expensive Avalon similarly suffers). The steering wheel hub, shared with a number of other recently redesigned Toyotas, looks especially awful. When stitching is molded into shiny bargain bin plastic it hurts far more than it helps. Check out the current Honda Civic for fake stitching done right. Some compact cars, including those from Chevrolet, Ford, Kia, and Nissan, have become impressively quiet. The new Corolla isn't one of them. On a concrete highway I found it difficult to carry on a phone conversation (via Bluetooth). Many reviewers have been critical of the Corolla's powertrain. Personally, I found acceleration in typical daily driving more than adequate. The larger problem, shared with the Sentra, is that revving the engine unleashes an unpleasantly buzzy racket. Both companies should have a chat with Mazda. It's a pretty lake, why not smile a little? Large-car legroom and comfortably high cushion, but limited headroom. As in the redesigned Avalon and RAV4, Toyota has abandoned the pillowy, insulted ride for which its cars have been known in pursuit of sportier handling. So the new Corolla also trails most competitors in smoothness and refinement. The ride remains far from uncomfortable. It's just not remotely luxurious. Compared to past Corollas, the new one has a higher seating position, deeper, more massive instrument panel, and smaller windows. An arched hood over the instruments serves no purpose other than reducing the apparent depth of the instrument panel, at the expense of making it appear more massive. But these changes merely bring the compact Toyota in line with segment norms. What really hurts the driving position, for me at least: both the door-mounted armrest and the steering wheel are too far away. The CVT makes the most of the 1.8-liter four-cylinder engine's nearly segment-trailing 132-horsepower (the Sentra is in the same boat, with 130). A 2,865-pound curb weight, similar to those of the Civic and Sentra but lighter than most others, helps. But, while thrust with an open throttle is easily adequate, there's no stronger option for thrill-seekers. Toyota offers no engine to compete with the 173-horsepower 2.0-liter in the Forte, much less the 184-horsepower 2.5-liter in the Mazda3. But then neither does Nissan. What the Sentra does offer is a more refined CVT. The power delivery of the Toyota's powertrain sometimes feels a littly lumpy. In its favor, the Corolla's CVT mimics a conventional seven-speed automatic when in sport mode. So the rubber band, slipping clutch effect typical of these transmissions can be avoided. The Corolla's front seats are much more form-fitting and properly supportive than their firmer, flatter counterparts in the Sentra. The headrests are nearly too far forward for my upright build, though. YMMV. As noted earlier, Toyota sacrificed ride quality in pursuit of sharper handling. Consider this goal partially realized. The Corolla does have a sharper, more direct feel than more refined competitors, including the Sentra. I personally find this refreshing, as the pursuit of refinement elsewhere has often rendered cars thoroughly uninvolving. Yet you'll find none of the finesse or fluid responses of a Mazda3 or Ford Focus in the Corolla. Something remains artificial about the feel of the Toyota's steering and chassis. Like the latest RAV4, it's the first draft of someone trying too hard with too little understanding of what a finely tuned driver's car feels like. With suprisingly aggressive styling and suspension tuning, the eleventh-generation Corolla should more strongly appeal to younger (and younger at heart) buyers, while retaining traditional strengths in reliability, fuel economy, and total cost of ownership. Abundant rear legroom is a further plus. But not everyone will like the new styling, and refinement (where Toyota used to lead) lags well behind an increasingly impressive segment average. While I thoroughly appreciate the effort and intent, and would much rather own the new Corolla S than the previous one, the end result isn't quite there. Hopefully they'll keep at it. Thirteen-cube trunk about even with Civic, Focus, and Mazda3. Others can hold a couple more cubes. The engine's noise bothered me more than its segment-trailing power rating. Toyota and Nissan each provided an insured car with a tank of gas. 2014 Toyota Corolla pros and cons, according to Michael Karesh: the best reasons for buying (or not buying) the 2014 Toyota Corolla. Join TrueDelta to post your own impressions. I bought a 2015 Corolla LE plus. I love the looks, the mpg is great. The only complaint I have is, it's terribly uncomfortable. So bad I have a back ache that won't go away. I went to the dealer (who I like) and wastold to see a chiropractor. Called Toyota and was told, too bad so sad. I'm trying different adjustments and adding support to the seat, but might have to bite the bullet and trade for something I can drive with out pain. Make sure you really test drive this car before you purchase. Any advice? Pretty much what you just gave, unfortunately, except that it applies to all cars, not just the Corolla. Nothing is harder to evaluate during a test drive than seat comfort. Whenever tells me seat comfort could be a huge issue for them, I suggest spending as much time in the seat as possible before buying. Maybe even rent the car for a day or two, if this is possible. @skruegar29 and mkaresh,I happen to find the seat incredibly comfortable. I have gone on multiple long drives from Sacramento to Medford to Eureka to San Francisco to Fresno and back with no leg or back pains...nothing more than expected from those long drives. Compared to my other vehicles, 2001 Toyota Tacoma and 2014 Subaru WRX STI, the corolla seats are comfortable. I am in my early 30s if that helps. I found the CVT tranmission in my LE ECO model to handle the hills very well, better than automatics i've experienced in the past. So far i love this car. See TrueDelta's information for all Sedans and Hatchbacks.